Fishing can be so much fun! In some of our past blogs, which you can read in the Recommended Reading section below, we’ve covered a few blog topics that we think every fisher-person should know. 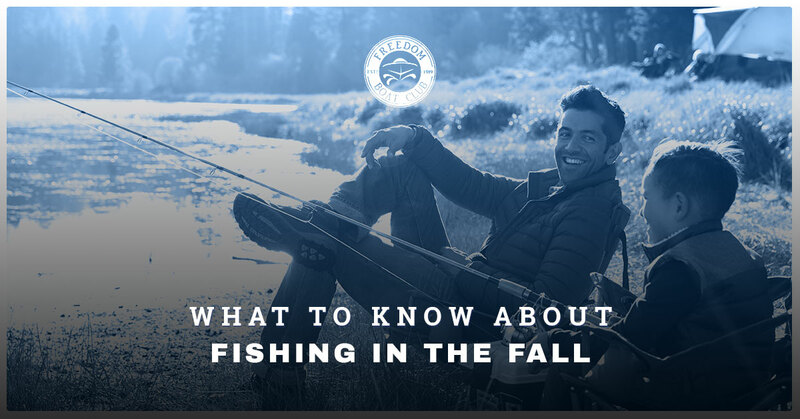 In today’s blog, we’ll be going over fishing in the fall. The autumn time can be one of the best times to fish because the different species are much closer to the surface as opposed to in the summer. Due to the weather being hotter in the summer, the fish will move deeper, so they are harder to catch. Fall time can be the best time to catch that big one, and with our tips, you can expect to catch all the fish you can in Lake Lanier. The best way to go fishing is to take out a boat, so you can go into deeper waters. Freedom Boat Club is a great boating club that will provide you with the watercraft that you want to ensure you get those fish. We offer speed and pontoon boats, so you can have your pick of what type of boat you want to take out. Take your family or just go by yourself to catch some big fish when boating on Lake Lanier. For more information about boating on Lake Lanier, contact Freedom Boat Club. If you’ve been fishing for years, then you probably already know that fall is a great time to go on the water. Fishing in the autumn can be the best time to go because you’ll see different species and they can be much more active. With cooler days, bagging that large fish is going to become easier. By following these tips and tricks, you can expect to have an enjoyable fishing experience. When you go fishing, you’ll want to test the waters. With the weather changing, the conditions of the water will change as well. This means that everything from the nutrient content to the concentration of oxygen will transform when the water begins to change. Generally, there’s a thermocline in the summer months. This thermocline is the ‘line’ under the water in the lake. Above the line, there are fish and below the line, the water is older and it’s inhospitable to fish because of the lack of oxygen. In the fall time, these two levels are mixed because of how the entire lake mixes from top to bottom. The fact that the water is mixed makes the fish able to occupy more areas of the lake as well as make them a bit more sluggish. When it comes to the bait, you’ll want to use different types depending on the fish that you’re after. You’ll want to chase the bait as well as mimic it because of how the species are feeding. By mimicking and chasing, you’ll begin to get specific types of fish. Due to the changes in the air, you’ll want to chase the bait by paying special attention to the species. If you fish with bait fish, you’ll want to find some of those before heading to the larger species. If you’d like to mimic the bait, then make sure to choose the bait that resembles their normal menu. As a fisher-person, you’ll want to follow the weather. Obviously, it goes without us needing to tell you that you’ll want to keep tabs on the weather when you’re going out on the boat to go fishing. It’s vital that you keep an eye on the weather for obvious reasons, but you’ll also want to do so to ensure that you’re catching the species you want. Bait fish will follow the wind, which can help you find the right fish to catch those big ones. Our last tip for fishing is to reduce the line test. This means that when you’re in deeper waters, you’ll want to suspend the line at different layers in the water. If this is a foreign concept to you, then we recommend that you try using a lighter monofilament than you normally would. By reducing the line test, you’ll cast out further and get your bait to where you want it faster than you normally would. Keep in mind, that you’ll want to invest in a quality line to ensure that you catch that big one. Are you ready to head out onto Lake Lanier to go fishing? To become a member at Freedom Boat Club, so you can go fishing whenever you want, contact us today.